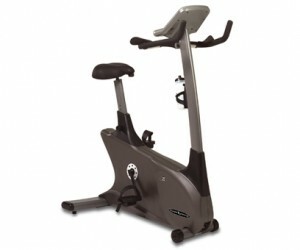 The E3200HRT is the top specification model of upright cycle from the Vision Fitness home range. An award winning model packed with features and manufactured to the usual high standards. For the majority, choosing an indoor cycle will involve several considerations but comfort should be at the forefront as without this the motivation to use it will be considerably lessened. The good news here then, is that the Comfort ARC™ gel filled seat is both large and extremely soft. Perfect for those with a larger build. The seat is height adjustable and if you are within the average parameters height wise (between 5ft – 6ft 4) then the lack of a forward and backward adjustment won’t be a concern as the distance between saddle and handlebars is designed to provide the optimum riding position whether you choose to “sit up and beg” or adopt a more aggressive, racing style. The elbow supports on the handlebars ensure this riding position is particularly comfortable. The pedals are self levelling with easy-adjust straps and the combination of an ECB-PLUS™ motor-operated permanent magnet, QUIET-GLIDE™ supersilent poly-V belt and 24lbs balanced flywheel means that the 16 levels of resistance available are smooth and responsive whilst providing a challenge for all fitness levels. 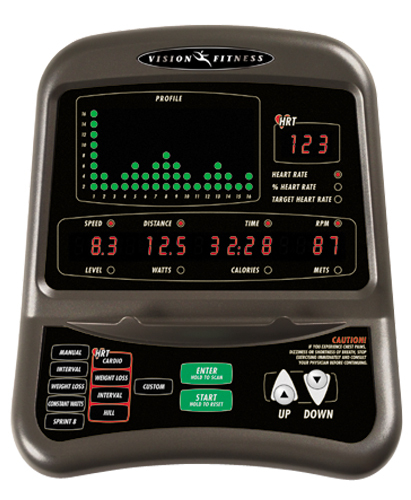 The console provides clear, well displayed feedback via a large LED profile display and separate windows for time, speed, calories and heart rate. Programs include several heart rate control options, interval training with Sprint 8 anaerobic training and even user custom programs if required. The console is polar chipped and a wireless polar strap is included for more accurate hear rate monitoring in addition to the telemetric pulse grips on the handlebars. A fairly standard size for an upright cycle with a footprint of 104cm L x 66cm W x 142cm H and a total weight of 47kg, the frame feels solid and more than able to handle the 135kg maximum user weight capacity. Vision have backed their sterling build quality with their usual market leading warranty, covering the frame and brake for the lifetime of the cycle and the remaining parts for 10 years with 5 years of labour thrown in for good measure. Great for peace of mind and a genuine reflection of the quality of this bike. In summary then, the E3200 covers all bases for those in the market for an upright cycle with great comfort and build quality and enough options to keep the majority motivated and challenged. Other prestige brands may offer the latest technical gadgetry in console options with ipod docks and online training facilities but pound for pound this bike more than holds its own. This entry was posted in £500 - £1,000, Vision Exercise Bike Reviews by Alex. Bookmark the permalink.